As summer encloses New York City and the promise of distant, cool weather becomes a mirage of an iceberg at the end of a sweltering subway tunnel (you will know what I mean if you have ever stood on a subway platform and had sweat drip steadily down your back to collect in your waistband or worse, at your feet), the prospects for foraging within the city's limits remain optimistic. My thoughts shift from fruit (serviceberries and mulberries) and buds (milkweed and day lily) to leafy greens and seed pods. It does not hurt that a trip to the beach is involved. Breezes live near the water. In June, I picnicked in a beautiful little public garden designed by Lynden B. Miller on New York Harbour, in Brooklyn's Red Hook neighbourhood. 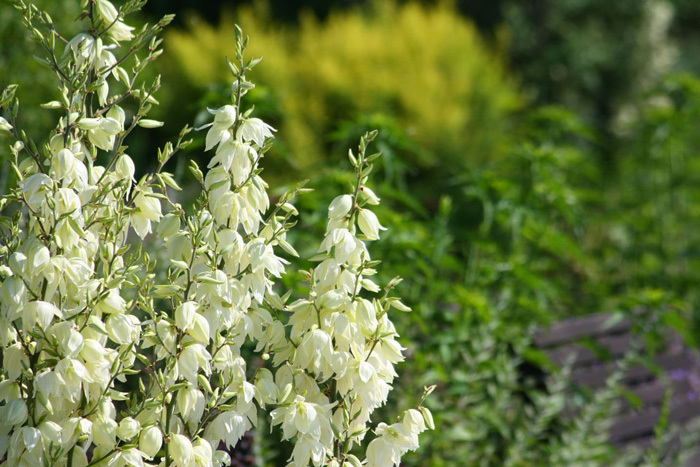 About a dozen Yucca filamentosa plants were in tall, creamy bloom, offset against grey spreads of blue-flowered lavender and a vivid lime Spirea thunbergii “Ogon”. I had always disliked yucca, used as a last resort by tired landscapers in a sea of too-large gravel, but this floral richness converted me in an instant. Back at home, researching the plant, I stumbled on something wonderful: its flowers and fruits are edible. A few weeks later, traversing the hot dune country of the Rockaways, a narrow barrier island in Queens, I squeaked to a halt in the sand and darted into the bushes, carefully dodging impressive poison ivy. I emerged moments later with some handfuls of yucca pods, green peanut-shaped cartridges of immature seed. My husband's French nose grew longer. I showed him the other yucca plants, still in bloom, and he softened slightly. At the beach itself I stopped to collect a few twigs of prolific bayberry (Myrica pensylvanica, now a staple spice in my kitchen). Back at home, in the kitchen, the pile of yucca pods looked intimidating. I had found precious few references as to what to do with them now, so I started to peel. Tricky little things. The green skin pulled back to reveal a snow-white interior of immature seeds. I tasted. Quite bland, vegetal, slightly bitter. I peeled on. Once a small bowlful had accumulated I prepared a pickling broth of vinegar, salt, sugar and bayberry seeds, bottled them, and waited hopefully. When I opened them after only ten days I was nervous. Not everything strange is good, not every plant a culinary delight. 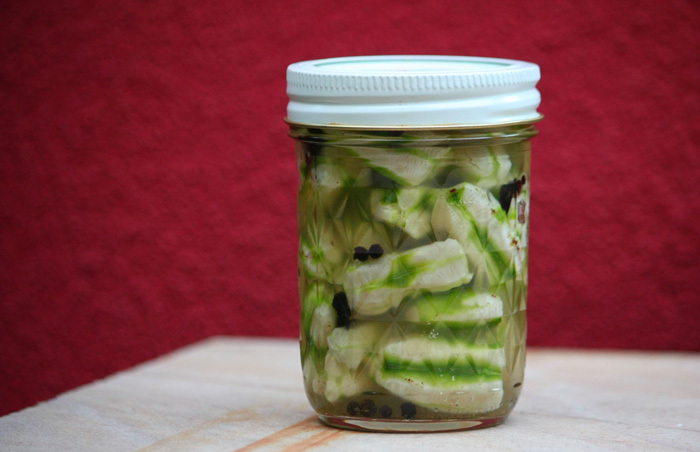 This pickled yucca might be consigned to the foraging heap of shame, which this year included redbud pods. In the vinegar, the bayberry and remaining green skin-stripes on the fruit had toned down to khaki. I lifted out a pod, tapped off the excess pickling brine, took a deep breath, let it out, and popped it in my mouth. Good! Great Scott! Now, a pickle is a pickle, and when in doubt, I pickle. So, there is that to consider. But they could have been awful. I was dreading a texture of slime, of mush, or a taste of tongue-recoiling bitterness. Instead the texture was crisp, the seeds themselves had each become delicately distinct, like the tiny leaves of an edible book. The flavour of the bayberry actually came through as well as the taste of what can only be described as…yucca. Bring the water and vinegar to a boil, and add the sugar, salt and bayberry. Stir to dissolve the sugar and salt. Turn off the heat and allow the liquid to cool slightly. Put the peeled yucca fruit in a sterilized jar and pour the warm liquid over it to the brim. Seal tightly and store in the fridge. Taste after two weeks. Serve with cured meats, sharp cheese, or smoked fish. Marie is a writer and photographer who lives in Brooklyn with her French husband and Dominican cat. She gardens on her roof and tiny terrace and blogs at 66 Square Feet and 66 Square Feet (the Food).